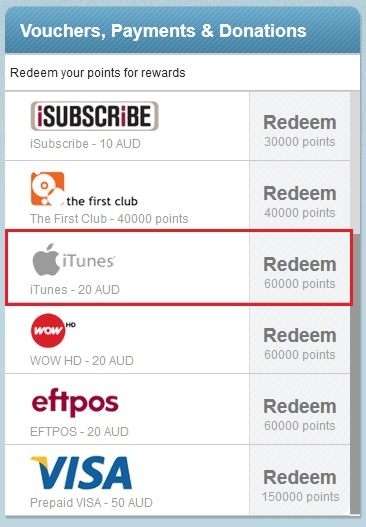 We’ve added iTunes gift cards as a new voucher option in our Rewards Centre! The cards can be used on Apple’s iTunes Store, and are sent ready to spend. Convert 60,000 points for a card loaded with $20 value. Choose from over 12 million songs, thousands of TV episodes and movies, and over 200,000 apps for iPod touch and iPhone. Compatible with iTunes for Mac or Windows. Please note that delivery can take up to 6-8 weeks. We hope to bring you more reward options, so stay tuned for more in the near future!